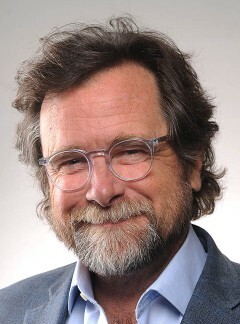 Hay-Adams launched the illustrative project years ago, commissioning Pulitzer Prize-winning political cartoonist Matt Wuerker and Kevin “Kal” Kallaugher to portray newsmakers in memorable ways. “Come election time, we will be able to provide some accurate polling in Washington based on the popularity of which coasters are requested most frequently by visitors, which should also make for some lively debate here as well,” Hans Bruland, Vice President and General Manager of the Hay-Adams, posited in an official press release. According to food and beverage director Julien Surget, OTR began showcasing the eye-catching contributions last spring. 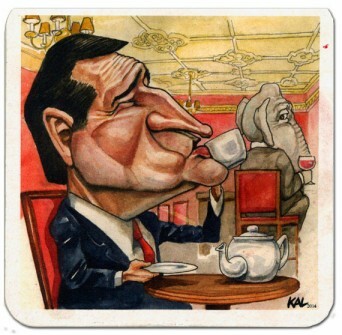 He explained that the newly minted caricatures of 2016 defector Wisconsin Gov. Scott Walker, dark horse candidate Sen. Bernard Sanders, I-Vt., and all-or-nothing freshman Sen. Marco Rubio, R-Fla., mark the 14th through 16th installments of the ongoing campaign. The new guys, Surget suggested, have some catching up to do to the old favorites. He calculated that the doodles that most frequently walk out the door to date tend to be split between 42, 43 and 44. 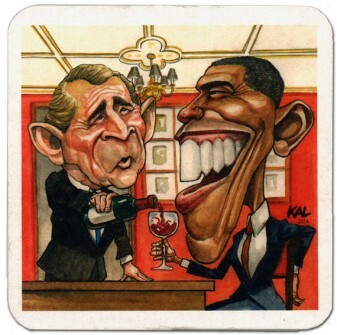 “The more popular ones are tied between Bush and Obama at the bar and the Clintons leaving the Hay-Adams,” he said of cheeky tableaus depicting President George W. Bush pouring Barack Obama a spot of wine, and another capturing an on-the-move Hillary Rodham Clinton with baggage-bound husband, Bill Clinton, in tow. The stragglers ought to be familiar to C-SPAN junkies. Per Wuerker, presidential prognosticating is by no means an exact science. Timing is just one part of the equation. 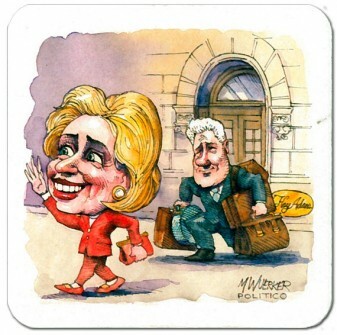 According to Wuerker, his creative process typically revolves around marrying humor with political insight — and, hopefully, a captivating visual. “Sometimes I get there, and other times I have to settle for getting two out of three,” he asserted. The self-critical satirist sounds relatively pleased with the latest drawings, but fears he may have taken too much creative license with a renowned sourpuss. “The Bernie Sanders one was maybe the easiest [this time around]. 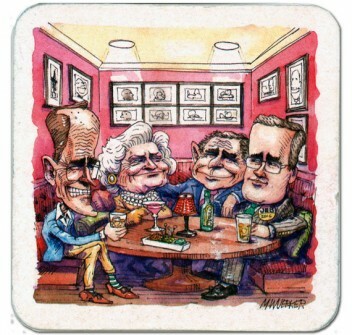 But in showing him smiling and having a good time at the bar I’ve heard from a few friends I lost his more curmudgeonly side …” Wuerker shared. He is a great admirer of Kallaugher’s command of the idiosyncratic second-in-command. 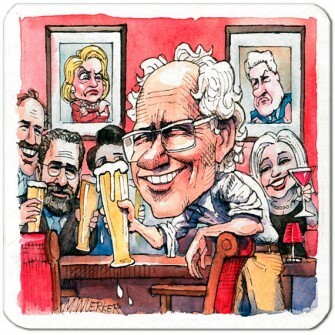 “I think he’s got Biden down by far better than the rest of us,” Wuerker commented. 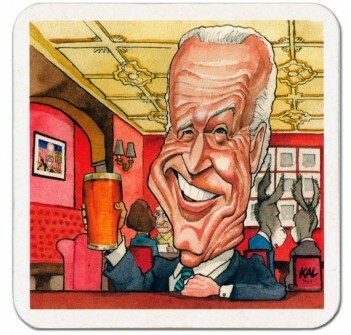 Given that Vice President Joseph R. Biden Jr., has elected to sit out this next round, Wuerker needn’t worry about perfecting that particular visage. Now if only the chameleon-like former first lady would fall in line. Just who might next merit the animated treatment — the standing order from Off The Record calls for the immortalizing of 18 power players — remains an open question. “There are always new characters rising up the pop charts. 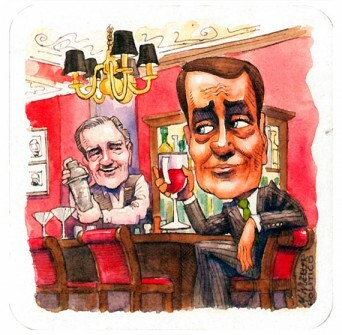 I imagine the new speaker would be top of the list,” Wuerker predicted. Surget shied away from detailing exactly how one motivates celebrated artists to keep cranking out political ephemera, noting only that local recognition certainly factors into it. “We are always delighted to have Matt join us at Off the Record and see the guests around him get excited about his designs. 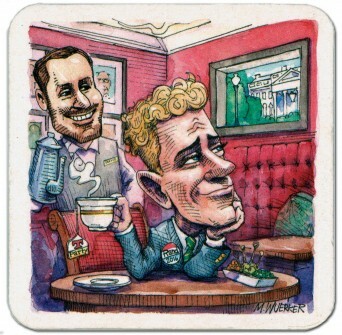 The more observant ones might even recognize him on one of the latest coasters issued,” he hinted. 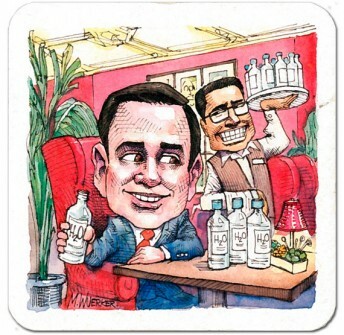 Wuerker was much more forthcoming, acknowledging that savoring complimentary tumblers of Knob Creek does wonders for his morale. Related: Satirist Sticks It to Prickly Presidents Graphic Artist Sparks Impromptu Bernie Sanders Rally at Comic-Con Bluewater Productions Toons Into 2016 Race Roll Call Race Ratings Map: Ratings for Every House and Senate Race in 2016 Get breaking news alerts and more from Roll Call in your inbox or on your iPhone.